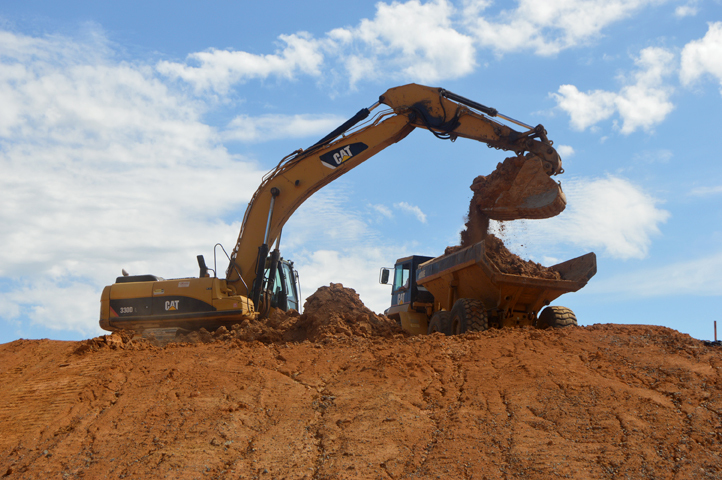 At the beginning of the summer, the ETSU football stadium still looked like a mound of dirt. 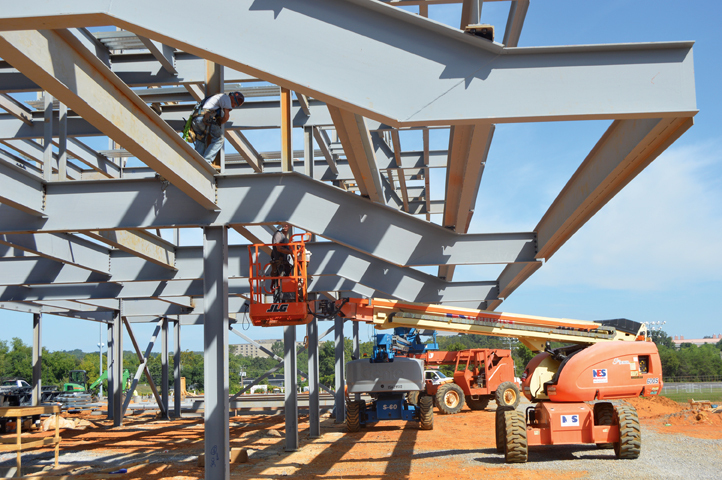 Now, it’s beginning to look more like a football stadium, and ETSU officials are enthusiastic about the progress that has been made over the last three months. 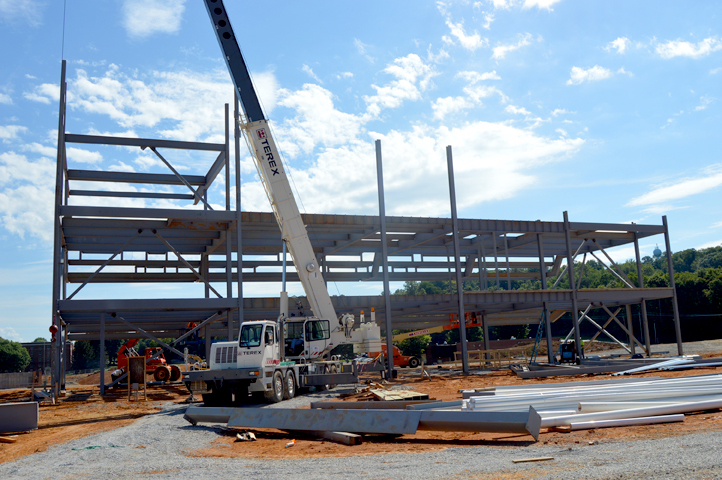 “The weather continued to be fantastic, so (crews) been able to stay right on schedule and maybe ahead of schedule,” said ETSU Senior Associate Athletic Director Scott Carter. The site beside the Basler Center for Physical Activity, which was previously a parking lot, has been carved into an elongated bowl – a bowl that will soon host an assortment of screaming fans. Various large earthmovers criss-cross the construction zone, relocating dirt from one corner of the stadium to another, and workers navigate a large latticework of interlocked metal beams on top of a plateau overlooking the basin. 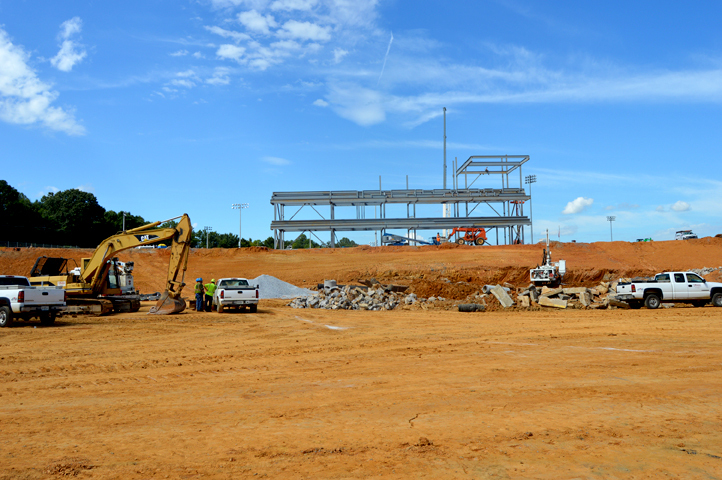 Crews are beginning to put together some of the structures that will eventually be on site, including the new skybox and a couple buildings that will eventually house concession stands and bathrooms. 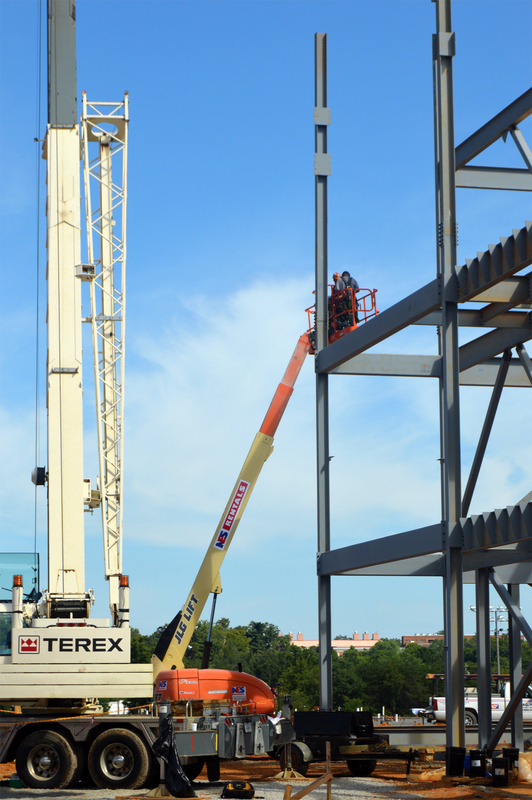 Chris Broglio, the senior project manager at BurWil Construction, which is acting as the general contractor for the project, said workers are currently setting the steel beams for the skybox, a process he anticipates will take another three weeks. 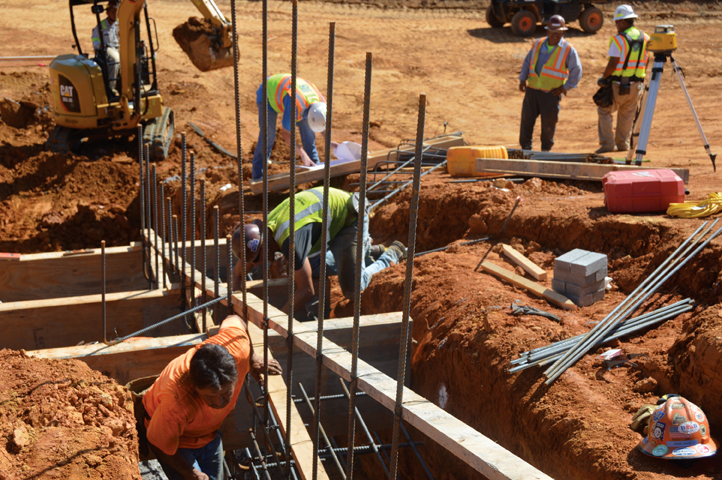 Workers are also in the process of constructing the concrete walls for the basement of the building on the northeast side of the site, and are installing underground utilities for the building to the northwest. The construction of the stadium will occur in two phases. The first phase will end in fall 2017 and will include a skybox, restrooms, concession stands and about 7,000 seats on both sides of the stadium. 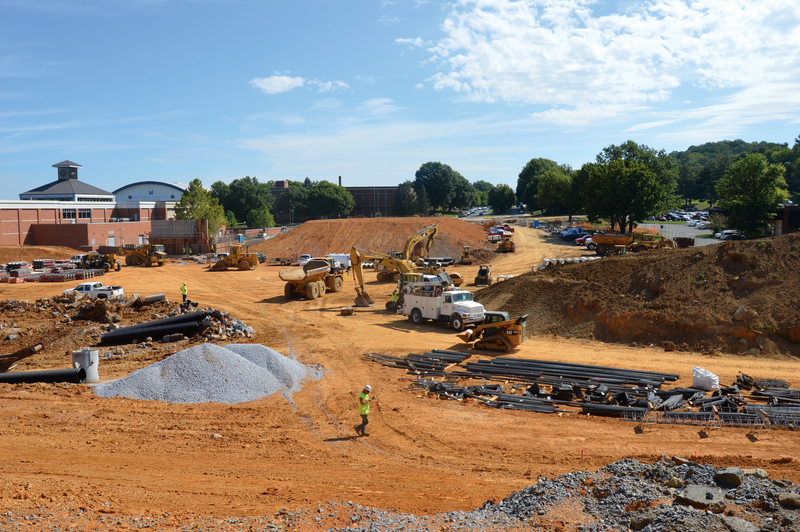 The ETSU football team will begin competing in the stadium in fall 2017, a milestone that will coincide with the completion of the first phase. The second phase will add about 3,600 more seats along a bare stretch of grass on the flank of the stadium and could potentially include added facilities to accommodate for extra seating capacity. 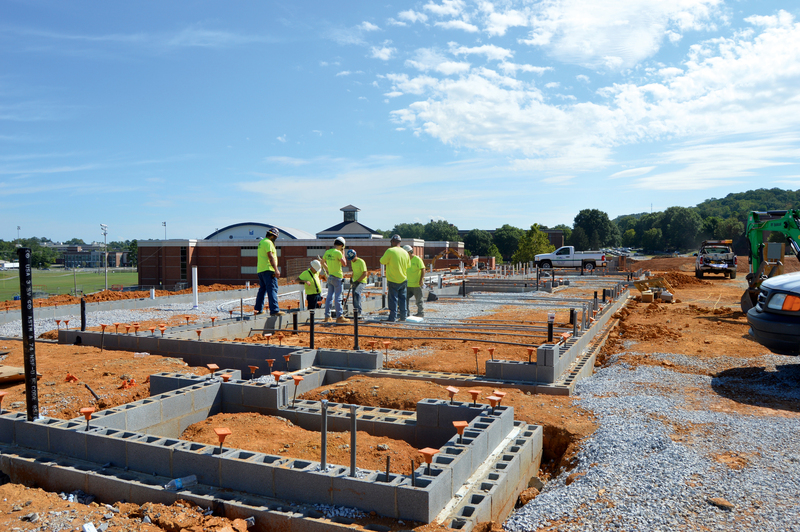 “I don’t know that they’ll be to the point of laying bricks, but I’d say they’d be getting pretty close to that,” Carter said. 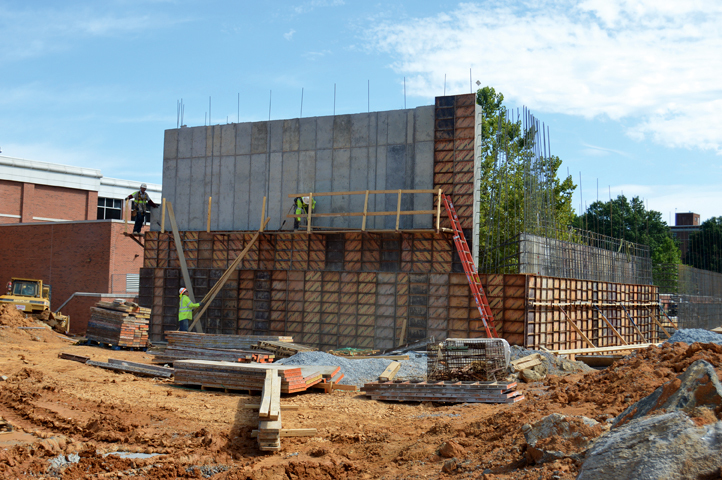 The university is still in the process of gathering money for the completion phase of the $26 million project. ETSU has an established funding model on the stadium website, which breaks down the sources of the funds. “We continue to push forward in that model, working to secure more gifts and more support so that the completion phase of this can be done,” Carter said. Some students have expressed criticism about the return of football and the construction of a new football stadium, but Carter said the facility is a logical step forward for the university — particularly in light of the large number of athletes the university has. Carter said that considering the building’s age, it’s become clear that the dome is not a viable location for football games, which makes the football stadium an important investment. “I think in the long term when students get to enjoy this and have that camaraderie and atmosphere on campus with their friends, with their peers, with their team, with their band, with the alumni, with all that, what that can bring to us is going to be incredible,” Carter said.